By Soccerlens on November 8th, 2010. The Soccerlens Awards are all about celebrating the very best in football from around the web from those breaking the news to those making it. A year is a long time for the web and so we make sure we spend time fine tuning the SLAs to reflect the changes and trends we see out there in the online football world. This year, less is more. We’ve cut the categories down from 17 to just 10 of the very best, including some new ones that we’re really excited about like the prestigious Best Football Website. For each award we’ll still have both Editor’s Pick and Reader’s Choice as usual, we can’t wait to see where we agree to disagree this year! 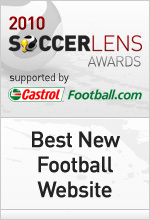 The Soccerlens Awards have a new home now, so get over to the brand new Soccerlens Awards website and get your nominations in NOW!